Petite Blythe "Sweet Spell Scarlet"
Is their someone you like? Then have Scarlet take care of it! Her sweet love magic will do the trick. Her outfit theme is black and deep pink. Her broom (an essential tool for magicians) is also in black and pink. When she needs to leave in disguise she can change into a black cat! 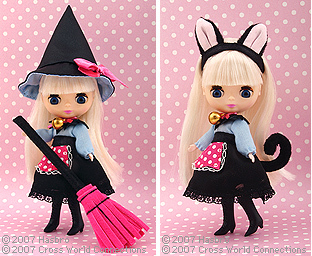 She comes with cat ears and a tail. Her bangs are silky white and straight and are contrasted by her bright pink lips making her looks so unique and cute. Her eye shadow is light grey She also features a new navy blue eye color with a forward glance!